Our FINAL (sob!) 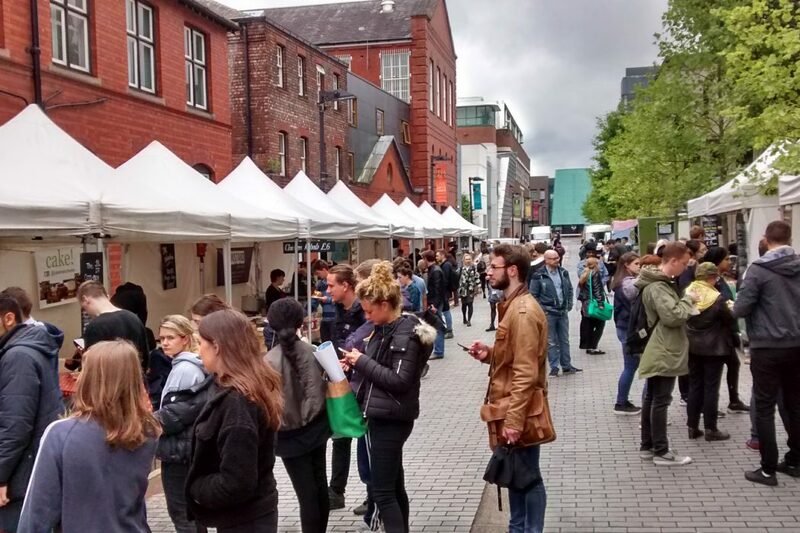 foodie market of the term at the University of Manchester will be held on Tuesday 6th June, 11.30am to 2.30pm, on Bridgeford Street M15 6FH. You can find us just off Oxford Road, next to the Manchester Museum. It’s the last one! After Tuesday 6th June, we’re off on our summer holidays (not really, you’ll find us doing lots of lovely fun stuff at Levenshulme Market at the weekends). Our clever traders have got loads of amazing scran lined up for our farewell feast, so make sure you don’t miss it! As the term draws to an end, we’d like to say an enormous thank you to the University of Manchester for their support and to you lot for turning up every week and eating every last morsel! And of course, big squishy squeezes to all our traders for working their socks off and cooking up such delicious treats for us every week. Don’t be too sad though, as we will be BACK in September and we’ve even got a few special surprises planned for you! If you miss us too much, why not head over to Levenshulme Market this summer? We’ve got Friday night markets and loads of live music, shopping and of course scrumptious street food on a Saturday. Hop on a train from Piccadilly and you’ll be with us in 5 minutes. See here for all the summer dates – we’d be delighted to welcome you to our fantastic Levenshulme family.